Donovan Jamal McNabb (born November 25, 1976) is an American football quarterback for the Washington Redskins of the National Football League (NFL). He was the Philadelphia Eagles’ quarterback from 1999 to 2009. In college, McNabb played football and basketball for Syracuse University. The Eagles selected him as the second overall pick of the 1999 NFL Draft. 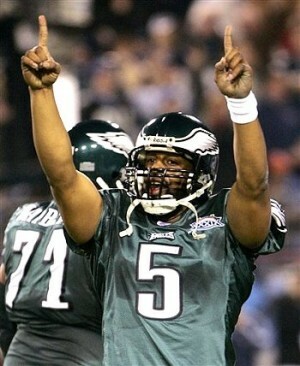 McNabb led the Eagles to four consecutive NFC East division championships (2001, 2002, 2003, and 2004), five NFC Championship Games (2001, 2002, 2003, 2004, and 2008), and one Super Bowl (Super Bowl XXXIX, in which the Eagles were defeated by the New England Patriots). Perhaps his most memorable play has become known as “4th and 26″, which took place against the Green Bay Packers in the final minutes of a 2003 NFC Divisional playoff game. He is the Eagles’ all-time leader in career wins, pass attempts, pass completions, passing yards, and passing touchdowns. Posted in Bios and tagged Donovan McNabb. Bookmark the permalink.